I’ve always been acutely aware of how different my right side is from my left. Early on in my practice, I noticed that in most of my standing poses, going to the right comes more smoothly for me. For example, in Utthita Trikonasana and Utthita Parsvakonasana, I can obtain greater length on the right side of my trunk and ultimately take my palm lower on the right than on the left. For a while, I thought of my right side as my ‘good’ side and my left as my ‘problem child’, but it wasn’t long before I realized that such a simplistic analysis just wouldn’t cut it. Yes, it’s true that in most of my standing poses, going to the right comes more smoothly, but in several other asanas, my right side is actually more challenging. For example, in Janu Sirsasana with my right leg bent my scoliosis is more pronounced than with my left leg bent. 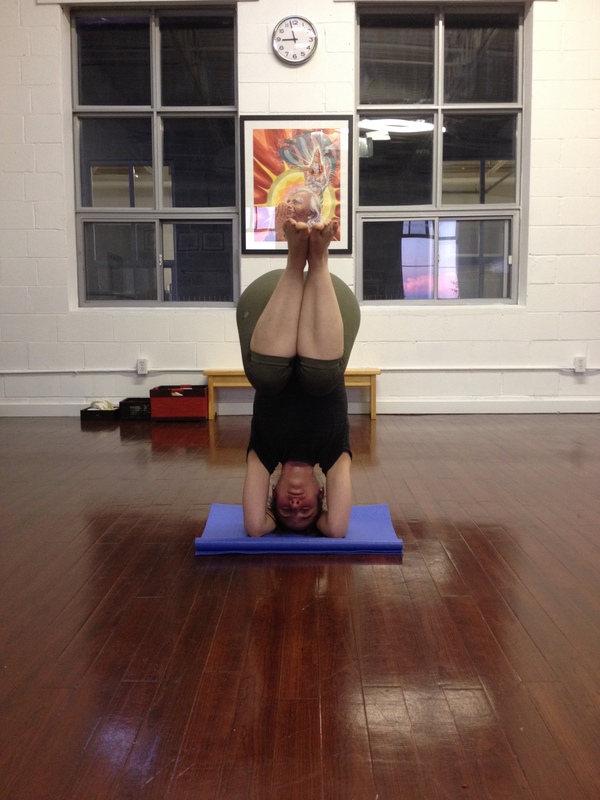 Also, Padmasana with my left leg is much more available to me than with the right. Recently, I had the thought to map out which asanas are better for me on which side, and see if I might be able to find some common themes, perhaps shed light on why these discrepancies appear. When I first glanced at the table, I thought that maybe my left side was better at asanas where the leg needed to externally rotate (i.e. Padmasana, Janu Sirsasana) and my right side was better at asanas where the leg needed to internally rotate (i.e. Eka Pada Sarvangasana, Utthita Hasta Padangusthasana 1), but then I remembered about the standing poses. In the standing poses, which also require an outward rotation, it’s my right side that performs better. Hmm perhaps, then, it’s the distinction between seated poses versus standing poses? Nope, Virasana throws that theory out the window. In Virasana, I always reach the ground first with my left buttock and in Supta Virasana, I struggle much more with my right leg. Wait a minute, maybe that’s it…one of the toughest actions for me is opening the middle groin and lengthening the front of my thighs, and it’s especially hard on the right side. Notice the degree of arch in my back with my left shin up the wall. With my right shin up the wall, the arch is much greater and I think this is because my right middle groin is tighter. When I again look at my table, this principle kind of works. The asanas where my right side behaves better are asanas where the front thigh is lifting up and in towards the pelvis. The asanas where my left side behaves better are asanas where the front thigh needs to lengthen away, towards the knee. Interesting… Now let’s just say that this conclusion is correct …what does it actually tell me? Is my right side the ‘good side’? Is my left side the ‘good side’? 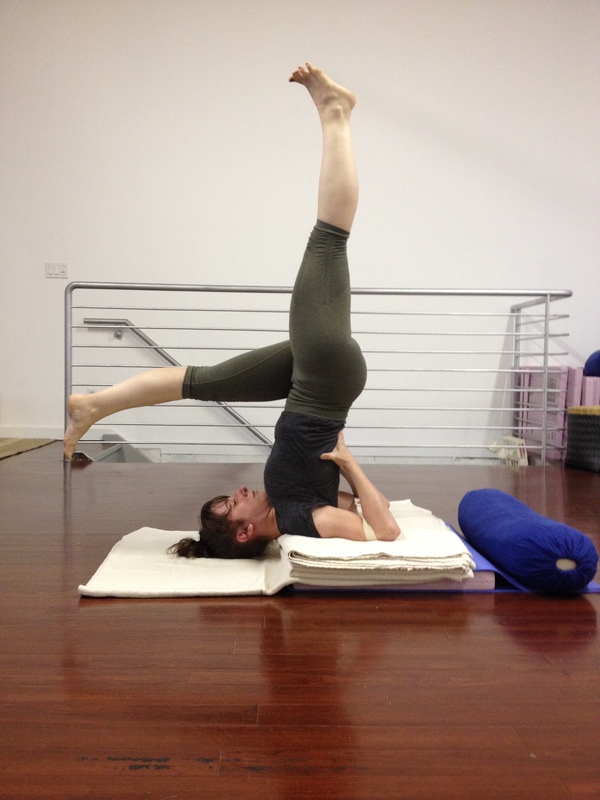 Recently, a colleague told me that my right hip drops when I’m lifting up into Sirsasana from the bent knee position. I was blown away by this comment. All of a sudden, the right groin that I held as the ‘model child’ in my Eka Pada Sarvangasana was now the ‘lazy child’ on my way up into Sirsasana. Eka Pada Sarvangasana lowering my right leg. Eka Pada Sarvangasana lowering my left leg. Lifting up into Sirsasana with bent knees. ART: I had to completely rework my presence in the pose to ‘see’ and feel the distortion. SCIENCE: I was acutely aware that cause and effect permeate the body, i.e. a soft groin can encourage a dropped hip. PHILOSOPHY: It helped me to deconstruct my notion of good versus bad and right versus wrong. I was especially taken by the philosophical impact of this revelation. Are there other areas in my life where I treat assumptions as fact? Areas where if I would only take the time to explore from a different perspective, I might come up with a very different opinion? It made me realize how easy it is to think I know something and let myself be fooled into believing that ‘thinking I know’ is the same as ‘actually knowing’. The fact that yoga brought this to light and allowed me to self-reflect like this is…amazing. There’s something incredibly inspiring & satisfying about coming away from practice with both a new outlook and (inevitably) additional questions to explore. Beautiful poses “good” or “bad.” This is a great exercise in swadhyaya to map out your favorable sides. I found this brilliant Stephanie.